Aah… there is something about the clean slate of a new year don’t you think? New chances, new goals, new plans, new grace, new faith. Have you decided to start trying to conceive in 2019? Or have you been trying for a while and are you ready for a new start? Well then, grab your favorite list app, your calendar & your filofax, and let’s get into these 5 fertility New Year’s resolutions! Prefer to watch the video? Click on the play button! Huh? This sounds nothing like any of the fertility resolutions I’ve read anywhere else. No? Good! That means this is something new for you. White space is the space in your calendar that is not filled up, it is the buffer in your schedule to allow for interruptions, errors, or just to BREATHE. White space is sometimes also called negative space in organisation. It is the concept of not cramming your cupboards but leaving extra space to make it easier to put things in their place and take them out without all other contents falling on your head. My point is: be adamant about creating space in your life, your schedule, your brain, your relationships. Make room to breathe, allow for mistakes, allow for throwing your diet out the window, allow for disappointment, allow for fun interruptions. If you do that, you will feel much more relaxed about your fertility plan as well as your resolutions. You will come out of the 2019 a happier and more collected person regardless of what happens. If you need help with analyzing your charts, post one or two of them in the private Becoming Vital & fertile group and tag me in (@ingefleurspreij). We will look at what is going on and if you have a hormone imbalance I can tell you what your options are to fix it. Trying to conceive can be very hard on a relationship if mommy-and-daddy-to-be don’t prioritize one another. You may feel like he is not supporting you in doing everything to make your baby-wish come true when he continues to have beer-outings and jumps in the hot tub after every gym routine. He may feel like you don’t want to make love to him anymore because you love him but just because you need a donor for offspring. Listen, these things are normal! Most couples will go through these feelings to some extent no matter how good the relationship is. However, to fall pregnant with a baby that comes from a place of love, and in order to give your child(ren) an example of a loving relationship, and to make sure you still like your spouse when the kids leave the two of you behind, you may want to make sure the foundation is good! Yes, just one. If you are smoking, quit that, it’s a biggy. The heavy metals in cigarettes alone can account for recurring miscarriages if one or both partners smoke (homeopathic remedies can help you make it easier to quit!). If you’re not a smoker, great! Then just pick 1 other bad habit. If you try to change too many things at the same time, you can feel discouraged when you’re not breaking told habits and sticking to new ones. However if you focus all your energy on 1 habit and get victory, that will likely enthuse you to try something else too! Many people that have changed their lives completely, started with only 1 good habit that lead to the next and the next. Need inspiration? Let me know in the comments which good habit you are going to start! If you want to increase your chances of falling pregnant and having a healthy happy baby, you need a strategy. The internet is filled with fertility resources, advice, services, communities. It can be so easy to jump from one thing to another, drowning in information and not sticking with anything long enough but getting your hopes up and crying over having to buy another pack of sanitary pads (or pulling out your eco-friendly cup for that matter!). If you sit down together and agree on the fertility steps you are going to take, that will protect your from shiny metal syndrome, and it will prevent fights for example on overspending. More importantly, it will get hubby on board and make him more involved if you include him from the beginning. If you aren’t sure where to start, you could have a session with a strategist like my personal strategist Helen. She is brilliant at helping you identify where you want to go and how to realize that with practical steps and accountability if you need that. What I recommend for your fertility plan? Diligently charting your cycle with an app and going over it with your partner (want to know which thermometer is my favorite?). A budget. Make sure to include white space in the budget for new things you come across that you want to include in your plan later in 2019. Homeopathic treatment. Yes of course I cannot leave that out, I am a fertility homeopath and see every day what an amazing tool this is in improving fertility and increasing pregnancy chances (91% success rate!). That homeopathy improves fertility I see long before the birth announcements, and before the positive pregnancy tests, I see it the first month already in charts after starting treatment with new patients. Diet choices. Agree together what you will include and what you will leave out. Remember to allow room for stepping away from the diet at times. I like to go by the 80/20 rule, eat 80% clean 80% of the time, and leave room for relaxing or LIFE 20% of the time. Self-care. Do you need to exercise? Do you need x amount of time with friends or family? Do you need to see a counselor by yourself or together? Anything else you think is important! Let me know in the comments what other things you would include in a fertility plan. Alright, that’s it! 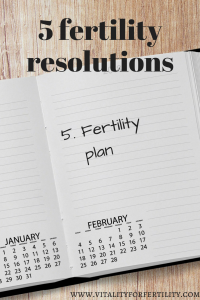 5 fertility resolutions for the New Year. Definitely comment below which resolutions you have made, or which habit you are starting or kicking, or what you will include in your fertility plan. I know lots of women that are on the same journey as you are, would love to read your thoughts and learn from you! I wish you a really blessed 2019, filled with wisdom, insight, laughter and love.